Way to screw up the one video that I need to post for Ben Bentil getting drafted ya jerk. You had ONE JOB! 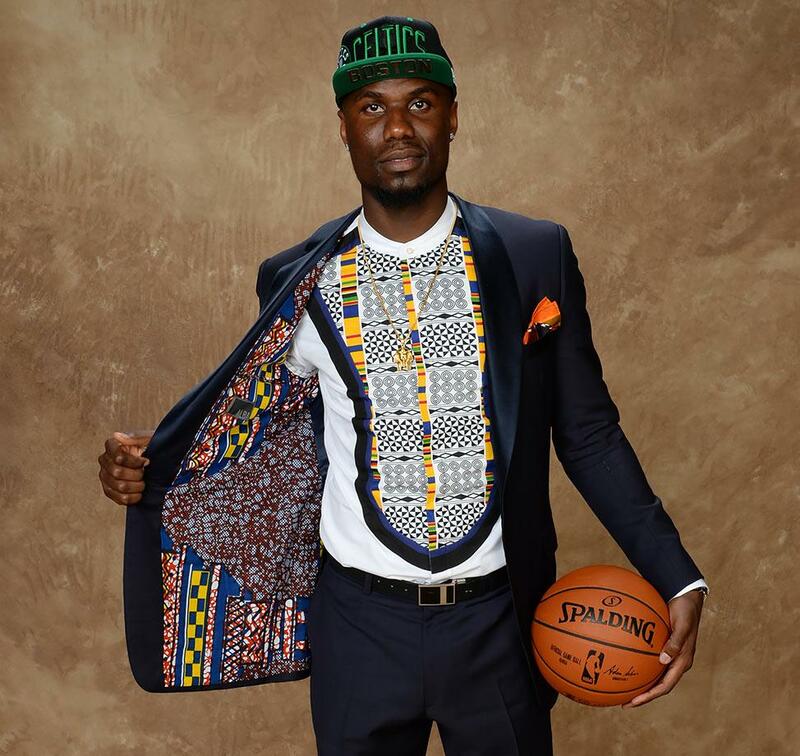 Ben Bentil had to wait around for almost the entire draft night but he ended up going to my Boston Celtics so I can’t be that mad at the end of the day. I read this somewhere but I can’t remember exactly who wrote it, but here it is anyway. If you were to tell me that the Celtics ended up with a Croatian basketball player and a player from Providence College in the draft, I think as a Celtics fan, I would have been ecstatic. Of course, those players might have been Kris Dunn and Dragan Bender and not Ben Bentil and Ante Zizic but what are you gonna do? 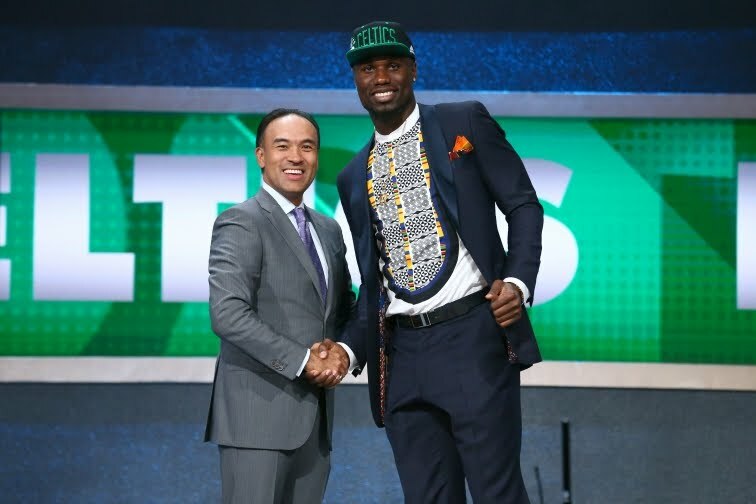 I personally think that Ben Bentil is going to be the steal of the draft, going 51st after being projected in the mid to late first round after demolishing the pre-draft workouts against other potential draft picks. The dude can ball and he fits the exact mold of stretch, athletic 4s that the NBA is trending towards. Ben needs to improve his lateral quickness so that he can defend some of the more athletic wings in the league, but if there’s one guy that I believe will put in the work in order to improve an aspect of his game, it’s Ben Bentil. His north-south speed is great and he can run the floor with anyone which plays right into the style that Brad Stevens has for the Celtics. One thing that there’s isn’t a questions about with Bentil is his attitude. It would be really easy to get down and upset about being in the stands at the NBA Daft and continuing to fall in the second round even though you’re listed as the best available pick for the majority of that second round, but not my man Ben. Dude is going to put in work, guaranteed. Let’s take a deep dive into Mr. Bentil’s past, present, and future basketball playing shall we. Ben Bentil had one of the biggest jumps in all of college basketball last year from his Freshman year to Sophomore year and was widely viewed as the most improved player in all of Division I basketball. His scoring went way up, ultimately leading the Big East scoring. He was a much better rebounder in his second year, some of that was out of necessity of playing a small lineup with Ben at Center (thanks for that again Paschal), but he showed an ability to grab boards and a tenacity to get after the ball. His shooting percentages in every category went up year-over-year as well, the most impressive being the free throws. Bentil has a beautiful stroke and with his vast improvement in free throw shooting, he was able to stay in the game during the crucial end-of-the-game situations and was actually the guy you wanted to get the ball to with a lead so that he could finish off an opponent from the charity stripe. Ben had a slight uptick in 3 point shooting percentage as well. He still needs to bump that up to be at least around 35% for opposing defenders to respect his ability to drain threes but its trending in the right direction. His quick first step with a pump fake will be that much more devastating with a threatening long distance ball. One of the most encouraging things about Bentil’s 3-point shooting is that he really tried to make the 3-point shot a part of his overall game last year. He went from shooting under 1 three a game his Freshman year to shooting 4.5 threes a game this past year. He knew he needed to develop that part of his game to become a more effective all-around player last year and perhaps the biggest attribute to Ben’s offensive game is that he is NEVER afraid to let it fly. He has confidence in every single shot he takes. As of right now, he a pure catch-and-shoot shooter who doesn’t really create jump shots off his own dribble. That may be more of a Kris Dunn effect in that Dunn created and pulled defenders off of other guys, thus opening up spot-up opportunities for others but it may be another aspect that Bentil can work on for his NBA game. That goes hand-in-hand with some ball-handling growth that’s to be expected of a bigger guy. With Bentil being taken in the 2nd round, it marked the 10th time that two players from PC were taken in the same draft, although many of those early drafts consisted of many more rounds than what the current state of the two round NBA draft does. If you wanted to go by having multiple players drafted in just the 1st or 2nd rounds, then this would technically be only the 5th time that has been done by Providence College. Ben was in the stands with the crowd at the NBA Draft and made his way down after being selected by the Celtics with the 51st overall selection. Ben’s outfit was pretty on point too. The Celtics seem to have a plethora of players that are currently playing the same role that Bentil would occupy on the current roster. Fortunately, GM Danny Ainge has repeatedly said that they are not done dealing this summer, so we can probably expect some changes to how the current Celtics roster is constructed. Current 4s & 5s: Jonas Jerebko, Jordan Mickey, Kelly Olynyk, Jared Sullinger, Al Horford, Amir Johnson, Tyler Zeller. I would say that those first 4 are really who’s in the way for Bentil’s path to the Celtics NBA roster right now. You can also throw the Celtics 16th pick this year, Guerschon Yabusele into that mix as well, although I would say that Bentil looks more NBA ready today than Yabusele does, at least at this point in time and I’m not so sure that the Celtics want to throw him straight into the NBA rather than letting him grow in either the D-league or overseas. The Celtics renounced restricted free agency rights to Jared Sullinger today, so he’s now an unrestricted free agent and can test the free agency waters if he so chooses. I think that the Celtics might try and bring Sullinger back on a 1 year deal if he doesn’t find anything overly appealing on the open market, but if he were to sign somewhere else, that would every-so slightly increase Bentil’s odds of seeing time this year. For all of Sullinger’s warts that Celtics fans like to harp on, his rebounding is desperately needed right now on this Celtics roster that is lacking any sort of rebounding presence. It’s not going to be an easy route to the Big League roster if some of the guys ahead of Bentil aren’t moved in a trade (hopefully not for a forward piece in return) but I can see a glimmer of hope and a potential path to the NBA roster if I squint a little. As is the case for anyone who is drafted by the Boston Celtics, your choice for jersey numbers is significantly dwindled by how many numbers the team has retired throughout their storied history. The C’s have 21 retired numbers right now…with 22 coming to future Hall of Famer Paul Pierce whenever he eventually calls it quits, so you can basically toss in #34 in with the below list. That means, numbers 00, 1, 2, 3, 6, 10, 14, 15, 16, 17, 18, 19, 21, 22, 23, 24, 25, 31, 32, 33, 35, & 35 are out the window. Ben wore number 0 in college, so I’m not sure if 00 being retired for Robert Parish technically means that the single 0 is unavailable or not. 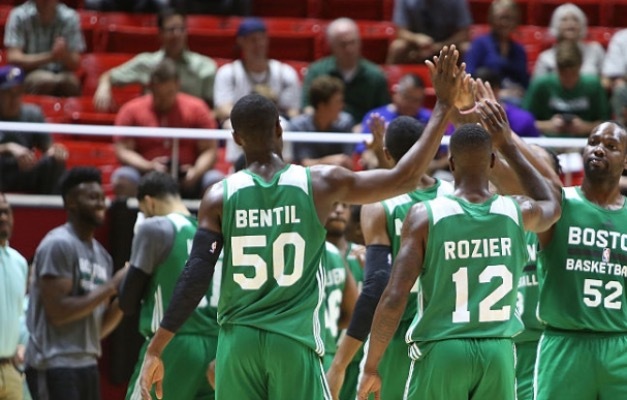 I don’t think so because I remember both Leon Powe and Eric Montross wearing single 0 but either way, Ben has been rocking number 50 in the summer league. I already have a number 50 Eddie House Celtics jersey, but I’m more than happy to have two number 50 jerseys in my repertoire if that ends up being the case. 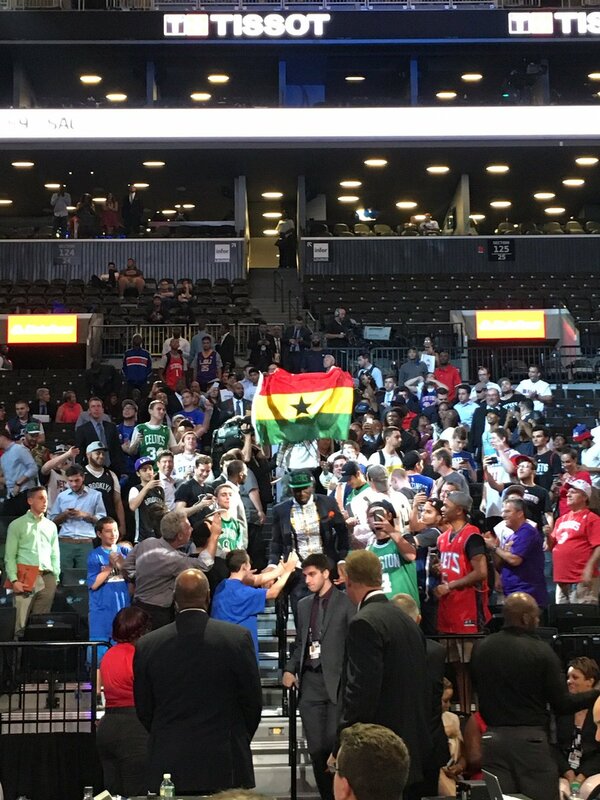 …but there was also some Ghana love flying in the crowd with Ben as he made his way down from the stands. From my (very) limited research, it looks like Bentil would be just the second NBA player from Ghana. Pops Mensah-Bonsu played a grand total of 62 games in the NBA, spread around a handful of teams (Toronto, Dallas, San Antonio, & Houston) from 2006 to 2011. Technically Mensah-Bonsu was from England but he was of Ghanaian descent. That’s as close as I could come to another Ghanaian player seeing any action in the league. So, for all intents and purposes, we can probably call Ben the first Ghanaian player in the NBA. Bentil played all three games in the Utah Summer League slate and looked good across the board. Ben averaged 8.7 PPG and 4.3 RPG in just 15.3 minutes per game. He shot an efficient 53.3% from the field and 80.0% from the line. He also had these two highlights in action from Utah. It’s definitely good start from Ben. 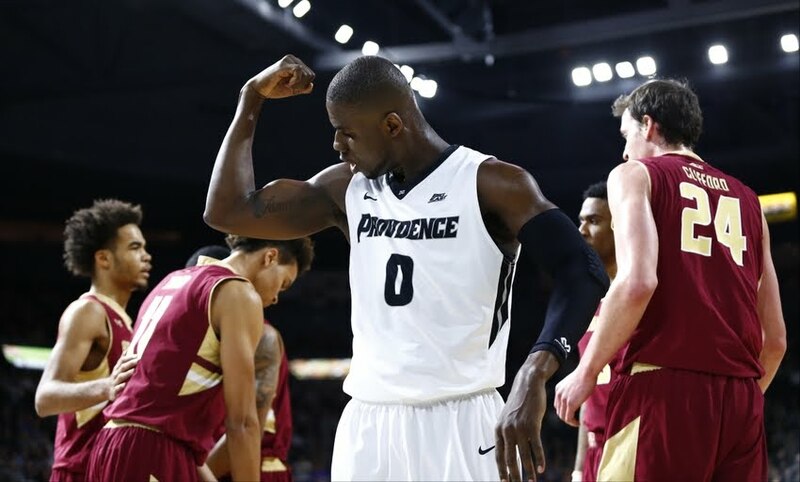 Fingers crossed that he continues to take advantage of every opportunity he gets, but from what Providence Friar fans know about Ben Bentil, that’s something we can count on.